The Pan Di Riva Restaurant and Bar will hold its grand opening on October 20, 2017, at 6:30 PM at #2 Dawson Lane in Burrell Boom Village in Belize. 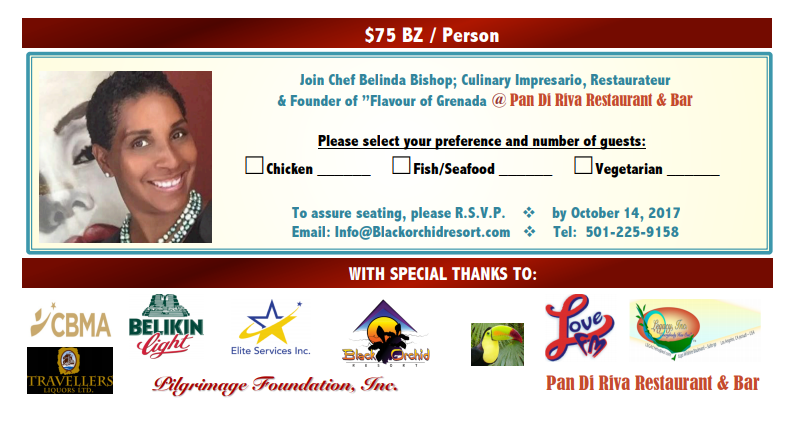 Chef Belinda Bishop, the author of “Flavour of Grenada” will be on hand to serve guests with traditional Creole dishes, locally sourced tropical fruits, and special drinks. Owner Douglas Thompson will host the grand opening in memory of his wife, Karen. Thompson, who is also the owner of the Black Orchid Resort in Burrell Boom Village, will use the occasion of the grand opening to begin the resort’s partnership with The Campaign for Black Male Achievement (CBMA), an American organization that works with young adult black men to ensure the growth, sustainability, and impact of local leaders who are dedicated to improving the lives of black men and youth. The Black Orchid Resort’s new partnership with CBMA that will officially begin on October 20, 2017, is part of a broader initiative to prepare for the CBMA international summit in July of 2018. The resort will be working with almost 100 young men coming from the U.S. and Belize to encourage them to become leaders and role models. The price to attend the grand opening of the Pan Di Riva Restaurant and Bar is $75 BZD, and attendees are strongly urged to make reservations as space is limited. Guests will have their choice of chicken, fish/seafood, or vegetarian entrees prepared by Chef Belinda Bishop. Reservations can be made by emailing [email protected] or calling (501) 225-9158. Chef Belinda Bishop is a native of New York City, born to Aruban and Grenadian parents. After working as a line cook in Miami, Chef Bishop rose to become the head Sous Chef for Marriott Hotels, overseeing five different restaurants and 72 chefs. Chef Bishop has worked with renowned Chef Kerry Simon in New York and is the author of “Flavour of Grenada”, a cookbook featuring traditional Grenadian recipes.